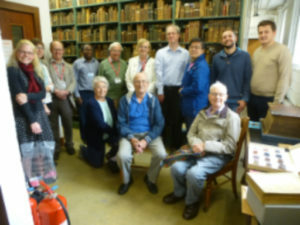 A warm autumn day in Cambridge saw a group of CLIS members and friends gather at the University Library to be warmly greeted by Dr Onesimus Ngunga, Librarian of the Bible Society (BS) Library. Onesimus gave us a brief history of BS: inspired by the story of Mary Jones and her desire to read the bible in her own language, it was founded in 1804 with the dual purpose of translating and distributing scriptures affordably in local languages. The library collection (now over 39,000 vols) was mostly acquired through various donations, and now they receive first editions of all new English Bibles. The collection was moved to Cambridge following BS’s move from London to Swindon. We were shown round the 2 floors of the library collection: the upper floor with Bibles in the ancient languages, plus Annual Reports of BS, and a beautiful painting of Bede transcribing scriptures by hand; the lower floor with Bibles in English and ca 2000 worldwide languages. a Madagascar Bible (1835) preserved during persecution by burial wrapped in animal skins – this emphasised what treasured possessions these Bibles were (and still are to the many still suffering persecution) – while we can take them for granted. We also saw a collection of Scripture portions given to the armed services in various wards [collected by CLIS member Rachel Johnson’s father]. Their largest Bible, an illustrated folio used in telling Bible stories. A collection of miniature Bibles, some in cases incorporating magnifying glasses! Manuscripts: more than 500 in 184 languages, the oldest is 4c. Coptic. Thousands of letters from missionaries (such as David Livingstone) recording their translation work. “Language files” about the work of translation, including the difficulties of finding appropriate words in cultures very different from the 1st century Near East. Visiting overseas students are immensely grateful to the pioneer missionaries/translators who went overseas enduring incredibly difficult situations to provide scriptures in local languages. The annual reports are a goldmine for their research, containing details of all the translation work. Several current legal disputes have been resolved through use of the library’s records. There is currently a scanning project to digitise Chinese Bibles and missionary letters. (See Christian Librarian Spring 2018 for details of this project and how you can help). 90% of the library’s holdings are now catalogued in electronic format. Preservation work is carried out in conjunction with the conservation department at the University Library. We are most grateful to Dr Ngunga for showing us the collection and sharing with us his gratitude and enthusiasm for those early pioneers of Bible translation – from Tyndale to the present day. There are still 5,000 languages worldwide with no Bible! Thanks also to Rachel Johnson for organising this visit.